We are very happy to let you know about the release of Pixelmator 1.1.4 since it features fixes for one of the most important functions of Pixelmator – color issues – some of which have been a big headache for us. But not anymore. Working on version 1.1.4, our main task was to repair color shifting issues, improve the Eyedropper tool, and enhance the precision of adjustment tools in Pixelmator, and we accomplished our goals. Oh, and thanks to your feedback, we also replaced the cursors, making them much more visible but still in the Mac OS X style. • A contextual menu for Eyedropper is now available and includes Copy (color) as HEX. 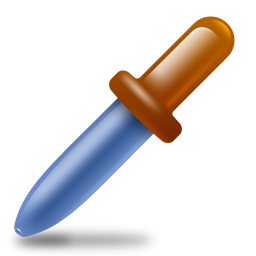 • When using painting tools, you can temporarily switch to Eyedropper by pressing the Option key on your keyboard. All the other changes are bug fixes (over 40) focusing mainly on color improvements and stability. Download version 1.1.4, and have fun immediately. Pixelmator continues to improve and I welcome that, but it would be great if the save for web and export options were worked on as a matter of priority. I have a nice photo..I want to re-size it and optimise it for use on a website and I might even want to print it out…you know guys the stuff that makes an image editor useful! Have these been fixed? If so do I need to do anything? (e.g. rebuild my workflows using the Pixelmator actions from scratch or something?). Sweet! It was quite annoying to have to switch to something else just to use the eyedropper tool. And as I said that, I tried to do it in 1.1.4 and the eyedropper’s color is STILL much darker then the real color… If you guys need anything to help fix this from me, just ask. I don’t know what I could do, but I am willing to help. It IS quite annoying to have to switch to something else just to use the eyedropper tool. All I really want in a magnetic/polygon selection tool. It would be really nice if I could cut out images. Some other selection tools like a rounded rectangle would be good aswell. Also I would like drop shadow and bevel. But other than that – I really like Pixelmator. I’m using it for the images on an e-commerce website and it works well. I really want to commend you guys on your continued support for Pixelmator. The improvements from v1 and v1.14 are so massive they almost warrant a version upgrade, but you continue to offer them for free to your early adopters. I’ve been finding myself using Pixelmator more and more often, and I feel the recent additions have really lead to this change. I only wish that more mac software developers followed in your footsteps! Sorry Jean-Marc but as impressive as the work on Pixelmator has been. It still needs a few basic functions before it can warrant a version upgrade. The one thing keeping me from buying is the lack of comprehensive JPEG export. I would like to see something in the fashion of graphicconverter. With a preview and different export options. I keep checking back to see if this is coming or not. I just wonder how to get to the new contextual menu for the Eyedropper tool. Ctrl+Click is not working with me anyway. And yes, I’m using version 1.1.4. Thanks for help! I think you guys are providing a great service, and to some degree a great app – with even greater potential. Your app could be better, many features missing that we are used to in Photoshop – But as Photoshop moves ever closer to the edge of “unimpressive” upgrades (see CS2->CS3, and now CS4) for mega-$$$, you have great potential to make the app better, AND gain acceptance among a growing audience – now using the aforementioned Photoshop(s).